Over 200 Chibok schoolgirls abducted in April 2014 by Boko Haram militants were not among a group of women and girls rescued by the Nigerian army in Sambisa forest Tuesday, the army has said. The Nigerian military said troops rescued 200 girls and 93 women from the vast forest which served as a hideout for Boko Haram, the insurgent group that has killed nearly 20,000 people. It could not however confirm whether the girls were students abducted from a secondary school in Chibok, Borno State, on April 14. The military said the girls were being “screened and profiled” to determine where they came from. “Troops this afternoon rescued 200 girls & 93 women from Sambisa Forest. 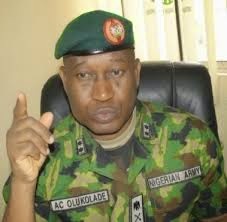 We cannot confirm if the #ChibokGirls are in this group,” the defence headquarters said on Twitter Tuesday evening. “Troops captured and destroyed 3 terrorists camps including the notorious Tokumbere camp in the Sambisa Forest Operation. But the spokesperson for the army, Sani Usman, a colonel, has told Reuters news agency the rescued girls were not, however, from Chibok.